Most of the master classes we attend involve a half-hour of the teacher's time for each student. The teacher listens to the student sing an aria and the teacher tries to give the student something to think about and work on. We always enjoy this. But this week we observed something far more special. This is the third year of an annual event at the Carnegie Hall Music Institute. 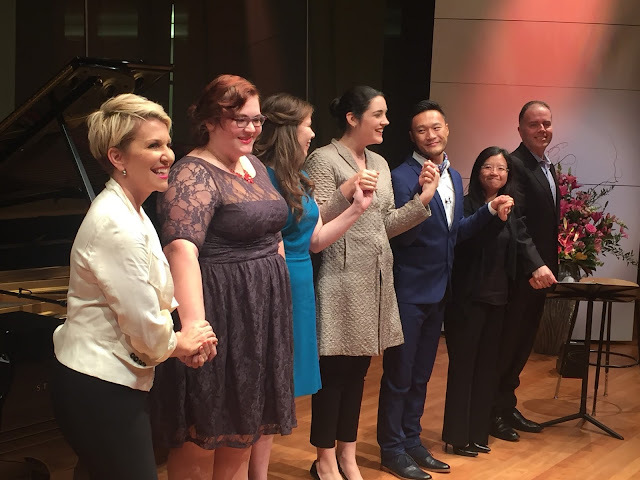 Each year, famed mezzo-soprano Joyce DiDonato spends three days with the same four young singers and works with them intensively. We witnessed some amazing transformations. Some teachers grind the same axe whereas Ms. DiDonato has something unique to offer each student depending upon the needs of said student. Her way of working is highly supportive and loving and informed by a great deal of psychological insight. One of the students began the event with an excess of self-effacement; by the end of the event she put herself "out there" and allowed her real self to shine through. Another student tried too hard to "perform" and was taught to relax. Students learned to speak their arias, to sing them while dancing or doing yoga. The important thing is not to do what is expected or sing the way the aria is customarily done. The singer must understand the character and the character's moods as they change from one minute to the next. This is what lends color to the voice. Those of you who read our review of the Richard Tucker Foundation Gala will recall just how "present" Ms. DiDonato is when she sings. The character is filtered through her unique prism. Ms. DiDonato is very "hands-on" and often conducts with her hands while the student is singing. She wants the student to focus on the process and not the end result. She is full of strategies to implement this and generous about sharing them. This is a process of discovery for the students who must trust Ms. DiDonato and also the audience which must create a safe space for vulnerability to emerge. One strategy is to practice an aria as if it were sung by a variety of different characters. What would this sound like if Rosina sang it? or Cherubino? The point is to have options and to be flexible. Practice with varying tempi. Surprise your voice. Teach your voice to respond to your thoughts. Eliminate your inner judge. Keep your thoughts positive. Much of the rest was familiar--the importance of the breath, connection, legato line, spinning the tone, not giving too much too soon, committing to the character. Acceptance for these classes is by audition and singers from 18 to 35 may apply for next year. Accompanists for the classes were Justina Lee and Djordje Nesic, both of whom excelled at keeping up.